What thrills you most about western Japan? Is it the succulent taste and fine marbled texture of the famous Kobe beef? It is the surreal reminders of historic events to be found in Hiroshima? Is it the rich history of the area’s countless shrines, gardens, and temples? Or, do you wish to indulge in the modern shopping experience of Osaka Station city? Whatever draws you, western Japan holds something for every traveler. 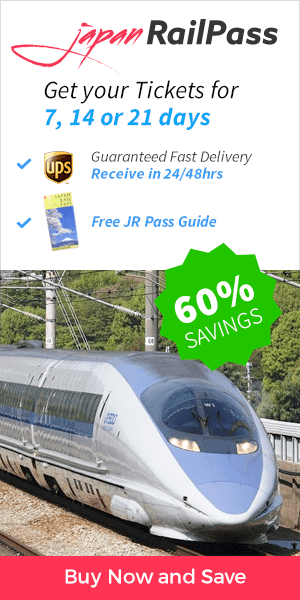 Now, with the help of your Japan Rail Pass, getting there and getting around are faster and easier than ever. Find out how you can use the Sanyo Shinkansen Line to enhance your next Japanese vacation. The Sanyo Shinkansen Line is a bullet train service that connects Osaka and Fukuoka, two cities on Japan’s third largest island, Kyushu. The Sanyo Shinkansen is important to Japan’s rail history – it was the second line to be built, completed in 1975, as an extension of the Tokaido Shinkansen. 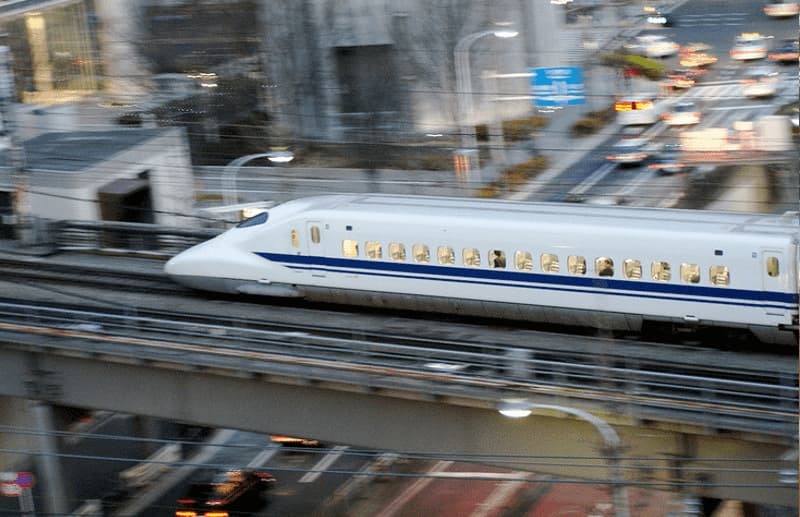 These bullet trains have revolutionized travel in Japan with their ability to zip from city to city at speeds of 300 kilometers per hour (185 miles per hour). The Sanyo Shinkansen Line runs between Shin-Osaka Station and Hakata Station in Fukuoka. You can activate your JR Pass for use by visiting one of the ticketing offices located at most major train stations. Those along the Sanyo Shinkansen Line include the Travel Service Centers or ticket offices at Kokura Station, Hiroshima Station, Shin-Yamaguchi Station, and Okayama Station. All trains operating on the Sanyo Shinkansen Line offer both reserved and non-reserved seating. If you would like to make seat reservations, you may do so at a ticketing counter. For either seating type, have your JR Pass ready to present at the departure gate. Please note that fares for the Nozomi and Mizuho trains are not included with the JR Pass. Using these trains will incur an additional fee. Sakura trains likewise connect to the Kyushu Shinkansen Line, stopping at additional stations along the way. 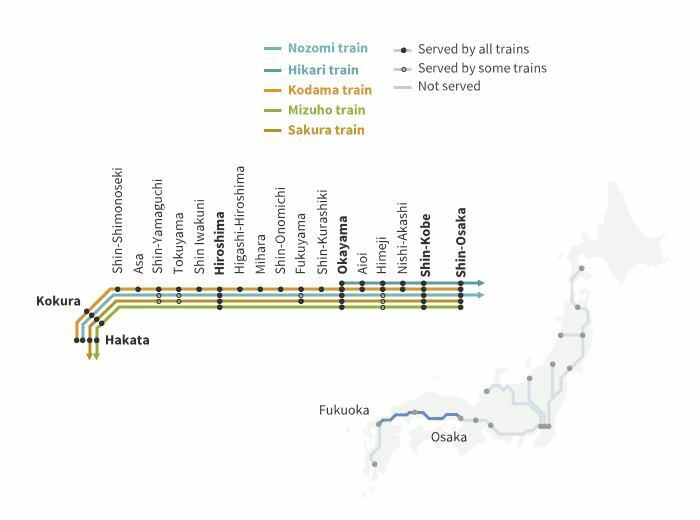 Hikari trains run once per hour, serving the stations between Shin-Osaka and Okayama. The Hikari trains also provide a connection to Tokyo. This route is often called the Tokaido-Sanyo Shinkansen Line. Kodama trains stop at all stations along the route, and are therefore slower than other options. A trip along the Sanyo Shinkansen Line via Kodama takes around five hours. Nozomi trains are fast, stopping only at select stations along the route. In fact, the Nozomi trains typically complete the course of the Sanyo Shinkansen Line in about 2.5 hours. Departures are made three or more times per hour. Nozomi trains also provide through service to the Tokaido Shinkansen Line. It should be noted that Nozomi trains are not covered by the JR Pass. Mizuho trains make about six round trips per day, typically in the morning and evening. These trains stop only at select stations along the route. The Mizuho trains provide through service to the Kyushu Shinkansen Line. Like the Nozomi, the Mizuho trains are not covered by the JR Pass. As noted, some trains of the Sanyo Shinkansen line provide through services to Tokyo’s Tokaido Shinkansen Line and Kyushu Shinkansen Line. The culture, food, and landscapes of Japan are calling to you. Book your JR Pass and start planning your next trip today.